In the IBM Power Systems universe, knowledge is power. Yet finding the latest and best information and hands-on training for this technology platform has sometimes been a challenge in many locales, including the Mid-Atlantic region. But take note: A new conference scheduled to take place in October in Virginia will shed a bright light on cutting-edge solutions and state of the art ways in which businesses and IT managers can maximize the power of IBM i for greater efficiencies, security and productivity. Sponsored by IBM, Hamway Software Solutions, Secure Infrastructure & Services, Surround Technologies and other select technology companies, the All-new Virginia Beach IBM i User Conference is set for Thursday and Friday, October 6-7, 2016 at the Virginia Beach Oceanfront in Virginia Beach, VA. The conference promises to be a powerful source of learning, information-sharing and networking. We invite you to join us for two days of spirited learning and networking. Conference topics will be far-reaching and geared toward education and information sharing related to the powerful IBMi platform. Among the areas to be covered are the latest OS updates, information on new storage options, Open Source, and modernization of legacy systems. The two-day conference will also feature important instructional presentations. These will include sessions on RDi, .Net, Cloud Services and Strategies for IBMi, Operational and Systems Management, as well as a range of other topics germane to IBM i. Sessions are also being added for Saturday and will include a half-day, hands-on RDi class. It’s not necessary to be in the Virginia Beach area, and everyone is welcome to attend. 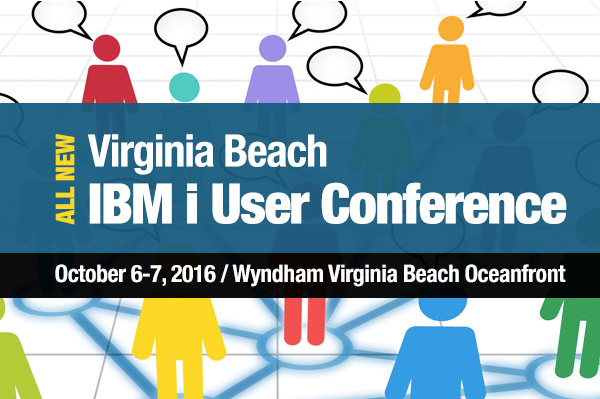 The All-new Virginia Beach IBM i User Conference is the first of its kind in the region, and we’re looking forward to an excellent turnout. We hope to see you in Virginia Beach on October 6-7!